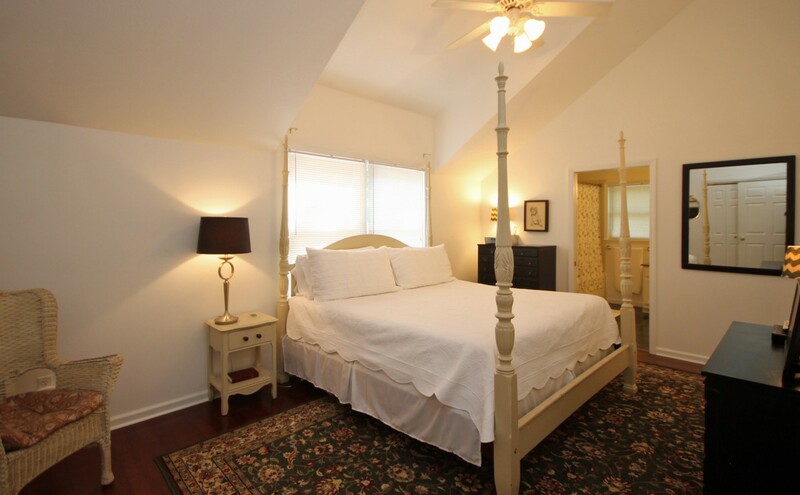 Welcome to the Carriage House, our beautiful two bedroom suite in the carriage house behind the historic Blake House. This is the lovely Carriage House. 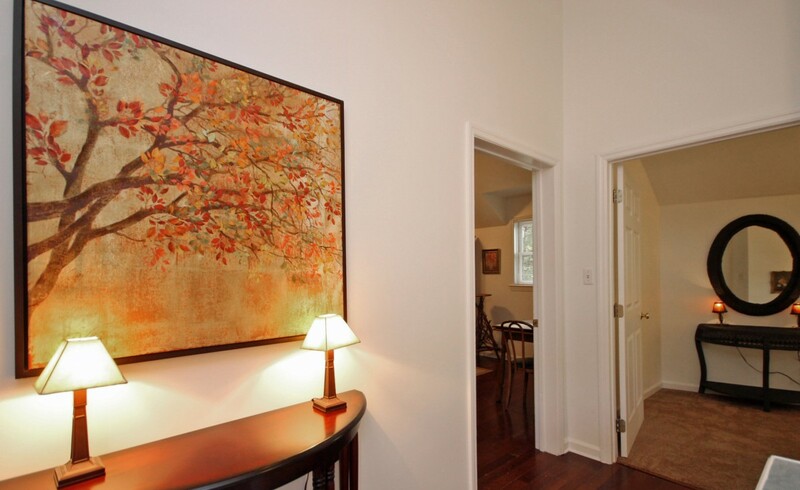 The living quarters are located upstairs and a foyer on the lower level just inside the door. A good view of the living area. The TV and DVD player are in the cabinet. 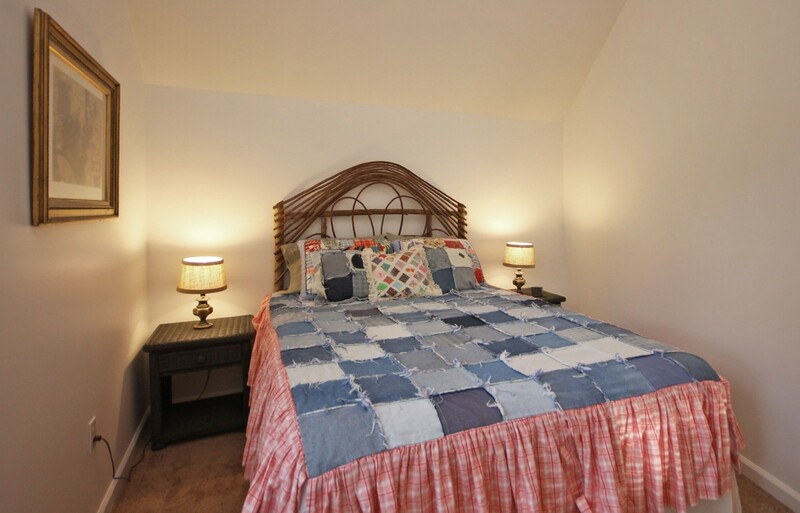 The second bedroom is bright and inviting. The well stocked kitchen has everything you need to fix your own meals while you enjoy Asheville. 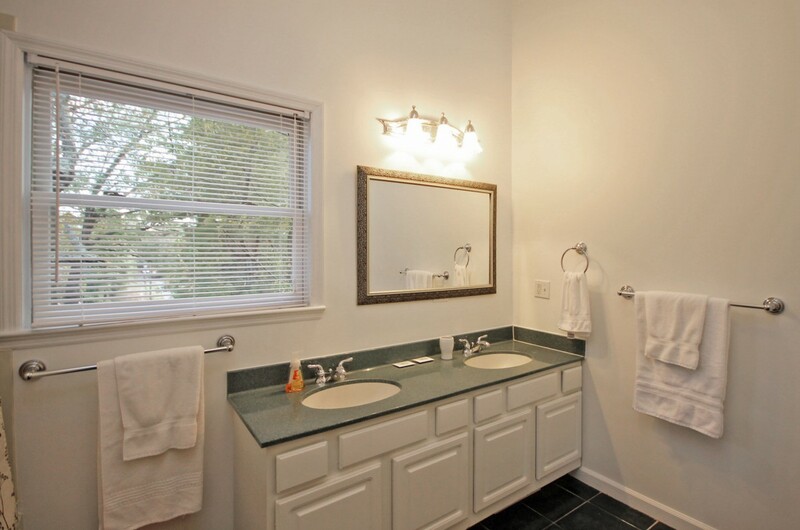 The bright, roomy bathroom features dual vanities. The bathroom is accessible only through the master bedroom so please be aware of this before booking. Here you can see the foyer that greets you at the entry to the Carriage House. We hope you love this comfortable four-poster king bed as much as we do!The bathroom is accessible only through the master bedroom so please be aware of this before booking. View of the living area looking toward the kitchen. 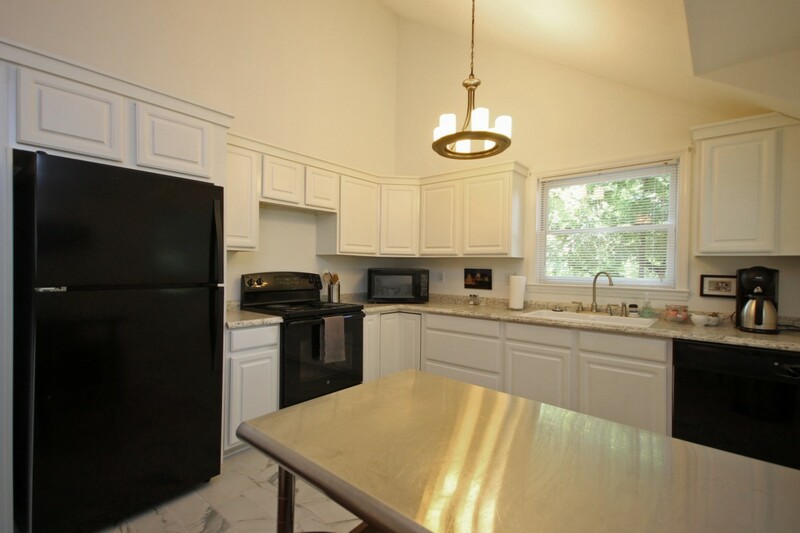 Plenty of space to cook in this roomy kitchen. 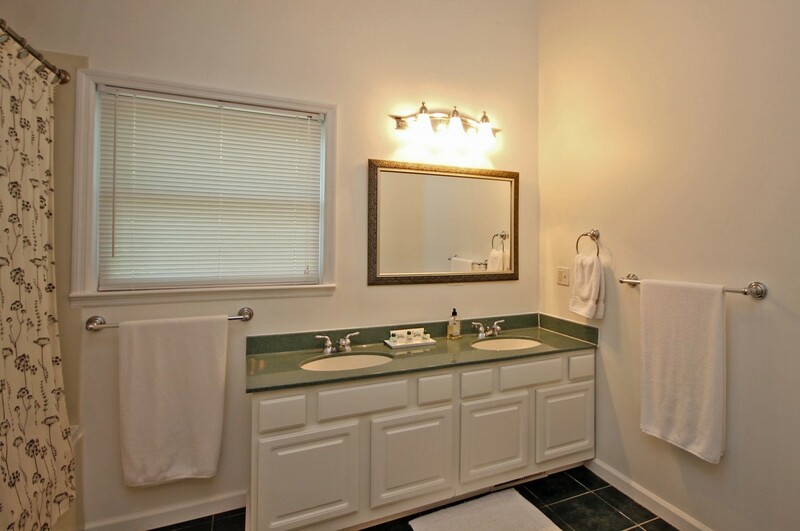 We are big fans of dual vanities, and we love how this bathroom turned out. The bathroom is accessible only through the master bedroom so please be aware of this before booking. This is the hallway located just at the top of the stairs as you make the turn to enter the suite. The entry to the second bedroom features a sitting area. 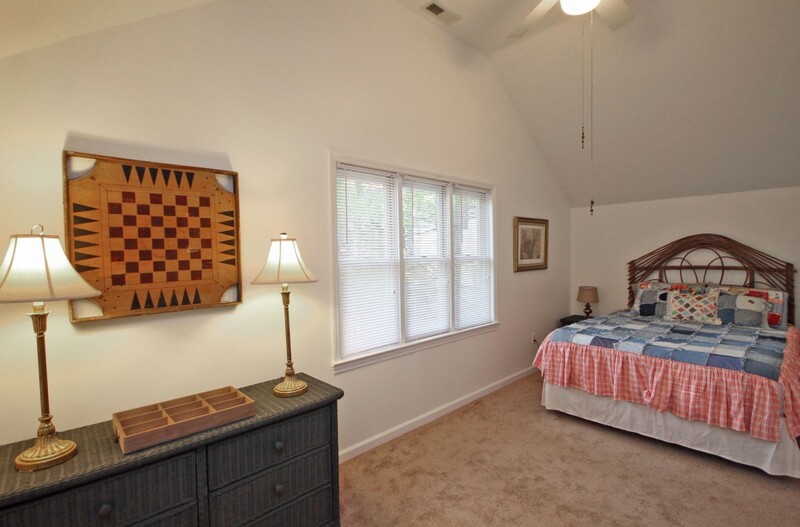 Here you can see the dresser and the queen bed in the second bedroom. 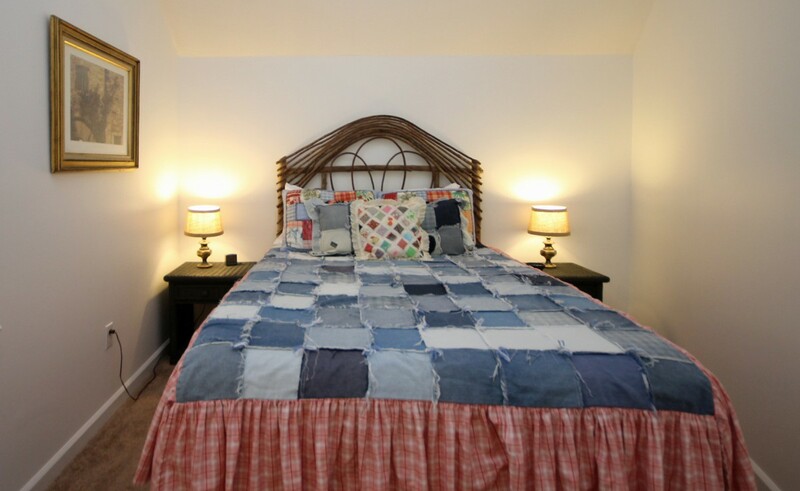 The second guest bedroom features a cozy queen bed with a whimiscal woven headboard. There is a sitting area in the foyer, located at the entry on the lower level. The stone patio and hammock are here for you to enjoy! 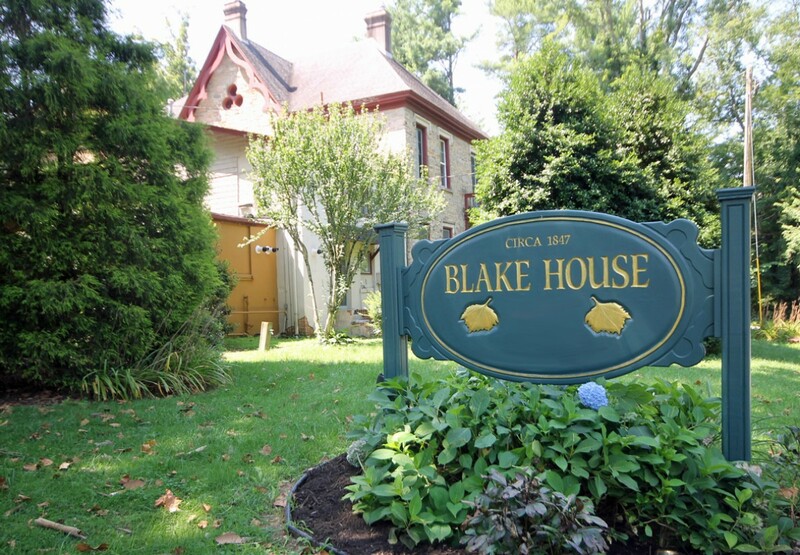 The Carriage House is located behind the historic Blake House, a beautiful home built in 1847. Here we are outside the front door. We are looking forward to hosting your visit! The bathroom is accessible only through the master bedroom so please be aware of this before booking. 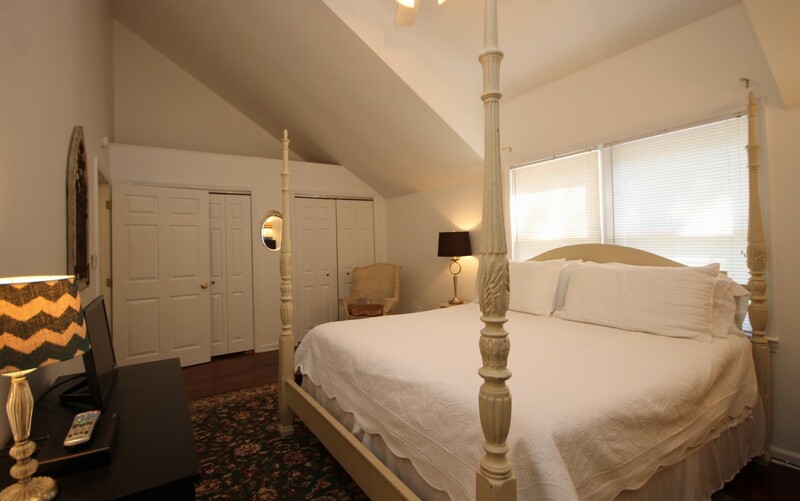 Welcome to the Carriage House, located on the upstairs level of the carriage house behind the main house. Please note there is a staircase. The bathroom is accessible only through the master bedroom so please be aware of this before booking. It is beautiful, sunny, comfy and delightful. We have spent a great deal of time and effort to make it perfect, and we hope you will love it as much as we do. Our Girls Weekend in Asheville was made even more memorable by the perfect accommodations! The Carriage House was perfectly suited to the three of us who travel together often, The fresh flowers that greeted us after our visit to the N.C, Arboretum topped off that day beautifully. The Propert Manager responded very professionally when we had to contact him for assistance and we were grateful or his kind and quick responses. On a personal note, as the grandmother of a UNCA student, I will make The Carriage House my “home” again the next time I visit! A great, clean easy to find location just south of Ashville. It was a wonderful location near coffee, ribs and fried chicken. The rooms were spacious, clean and at set a great temperature upon arrival. anyone looking for options in Ashville - this is it! We are glad that youe enjoyed your stay. It sounds like you found 12 Bones and Rocky's Hot Chicken Shack as well. My wife and I relocated from Wisconsin and were fortunate to call the Blake House home for 3 months (Nov. to Feb. 2019). We stayed in the Carriage House and everything was just wonderful. It was like a 2 bedroom apartment with a full kitchen. The hosts, Brian and Stephanie Marshall, are such nice and amazing people. We were so glad to meet them. The Carriage House had everything we could possibly need plus more. It was very well appointed and decorated. The bathroom is huge, Cable/Smart TV's and comfortable beds. The location is great as well and you're close to shopping and all the local activities. 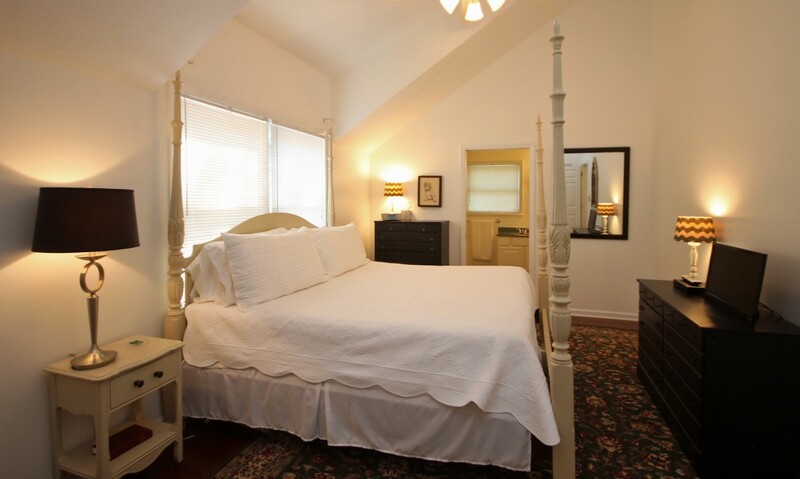 We would definitely recommend the Carriage House to our family and friends and anyone needing a home away from home with great hosts. It was a pleasure to host you and your wife over the winter. We hope you are enjoying your new home. A very large and cozy space for four guests. The only issue is that there is one bathroom and it is located within the bigger bedroom. Other guests must walk through the bedroom to get to it. We clearly advertise and have pictures showing that the bathroom is only accessible through the master bedroom and it is also mentioned in reviews. We apologize if that was a surprise when you arrived and hope that you still enjoyed your stay. The Carriage House was just the right size and had all the comforts of home. Clean and close to many hiking trails and local sights. We are glad that you enjoyed your stay and hope that you can come stay again. This Carriage House is a jewel of a retreat. It is cozy, welcoming and spotless. While I always stay very busy with friends when visiting Asheville, I always looked forward to my time in this apartment. Love how open and bright space it is. It is my top choice for all visits to Asheville. Thank you for the kind review and for staying at the Carriage House. It is a pleasure to host your stay. I was amazed at how clean the rental was. I liked the location. I used both Uber and Lyft to visit the local breweries. Neither had problems finding the rental. I've recommended this rental to friends who want to visit Asheville. If you do, take the Sierra Nevada Brewery tour, ride the LaZoom comedy tour bus, and visit the Beehive Coffee Bar for their Latte's and the Cheesy muffin and egg biscuit. It sound like you had a lovely stay and visited a lot of the best places in Asheville. Thank you for staying and recommending us to others. Carriage House as advertised. Spacious enough for 2 and private retreat. Well maintained and super-clean unlike some rentals I've seen elsewhere. ~10min drive to Biltmore Estate gate/Biltmore Village. Had a wonderful stay in the Carriage House with a 1 and 3 year old. We met one of the owners, who made us feel welcome and let our daughter pet one of their rabbits and swing on their enchanting swing. He also gave us recommendations upon asking and made sure we had everything we needed. It was a pleasure to host your stay. We are do glad that you and your children enjoyed your stay. Beautiful just like the pictures. Clean,great location, would definitely stay there again! The owner's are charming and helpful. Thank you for staying. It was a pleasure to host your stay. We stayed in the lovely Carriage House. It provided easy access to restaurants, shopping and highways to near by communities. We had all the comforts of home. It was the perfect place to return after our daytime adventures. The hosts, Brian and Stephanie are very attentive to ensure their guests have a wonderful stay. 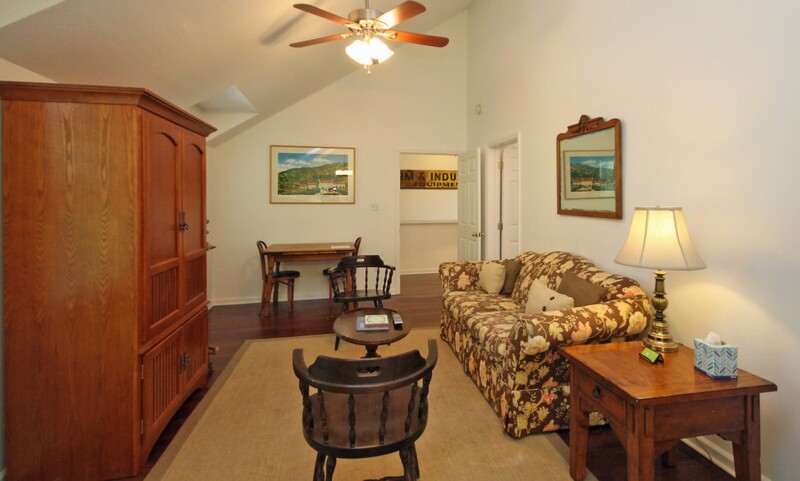 I highly recommend the Carriage House for your Asheville vacation rental. We appreciate you renting and are glad that you enjoyed your stay. We hope you can come again. Great property and very pleased with stay. This carriage house was even better than I thought it would be. The location is so close to everything we didâ€”The Biltmore, Sierra Nevada Brewey, downtown Asheville & Grove Park Inn. It was clean, quiet, had everything we needed & thereâ€™s a cute little coffee shop just around the corner, The Beehive, that has the best coffee & fresh muffins & bread. I will definitely be back to stay again! The only thing that may be difficult is that the one bathroom is only accessible through a bedroom, but it was not an issue for our girls weekend & it will be fine when I come back with my family. Thank you for staying! We are glad that the location worked so well for you and that you discovered The Beehive. We look forward to hosting you and your family. 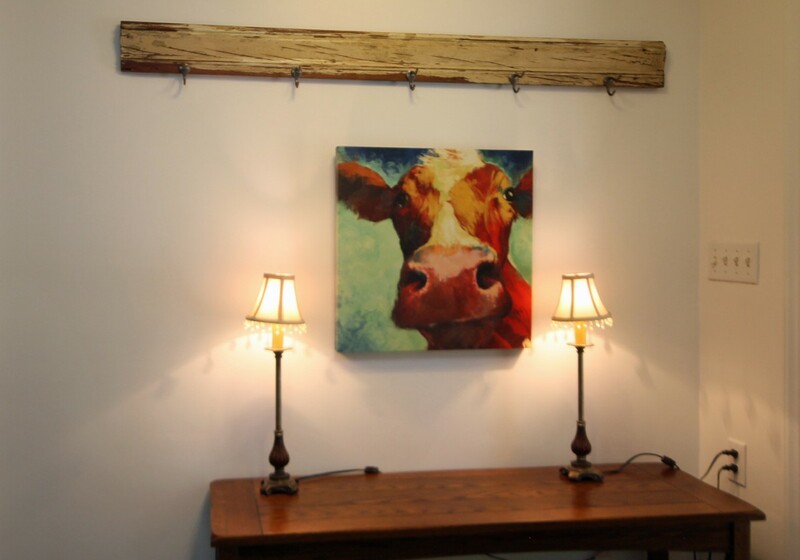 We loved another stay at the Carriage House! Thank you for staying again it is always a joy to host your stay! We are so happy that you enjoyed your stay! We would be happy to have you stay again anytime. Booked this rental through HomeAway. Reservation was convenient and reasonable price. Property manager contacted me through email and provided full instructions. Rental property was clean, well lit, cutely decorated, and well furnished. 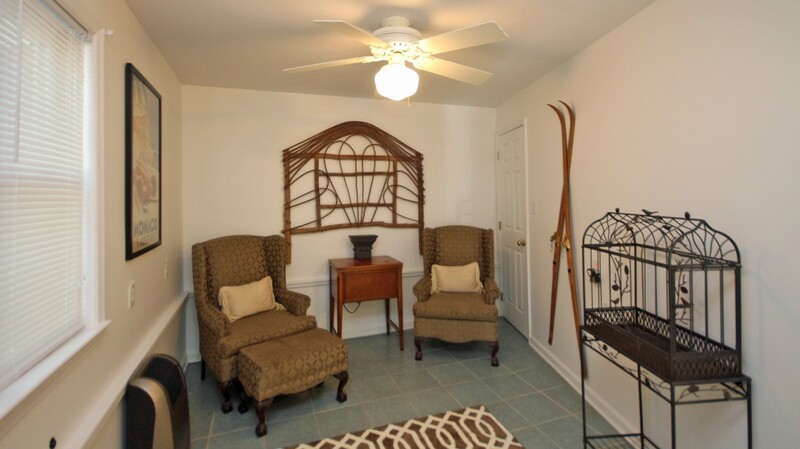 Our family enjoyed this property completely and will consider this rental again. We are so glad that you enjoyed your stay and hope that you can come back again. great location to explore asheville, the biltmore estate and the blue ridge parkway! heating and ac working great, hard to open the windows, but managed with some muscle power. only bathroom is through one of the bedrooms, it was posted on the site so we knew. best coffee shop in arden across the street! Thank you for staying at the Carriage House. The location is really perfect for exploring all that Asheville has to offer. So glad that you discovered Beehive Coffee. 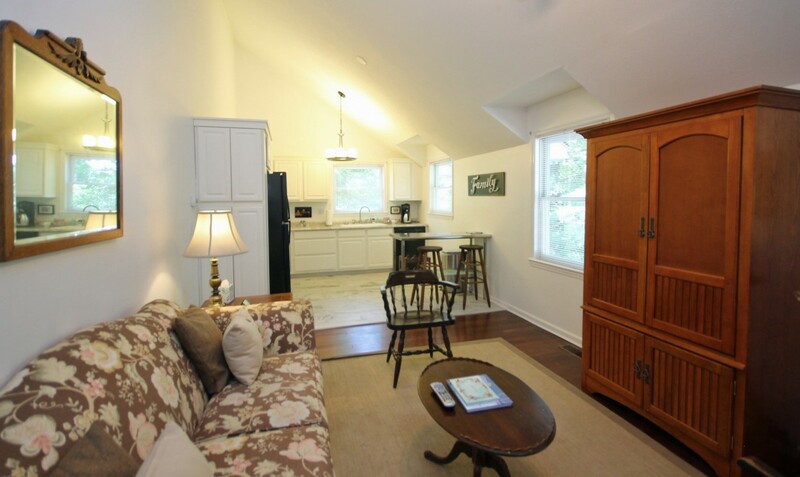 The Carriage House was a very nice 2 bedroom unit that had all the comforts of home. We met the owners and they were very friendly people. The unit was conveniently located about 10 minutes south of the Biltmore Estate, which was the main thing we wanted to see on our visit. Lots of good restaurants nearby. We are so happy that you enjoyed your stay. 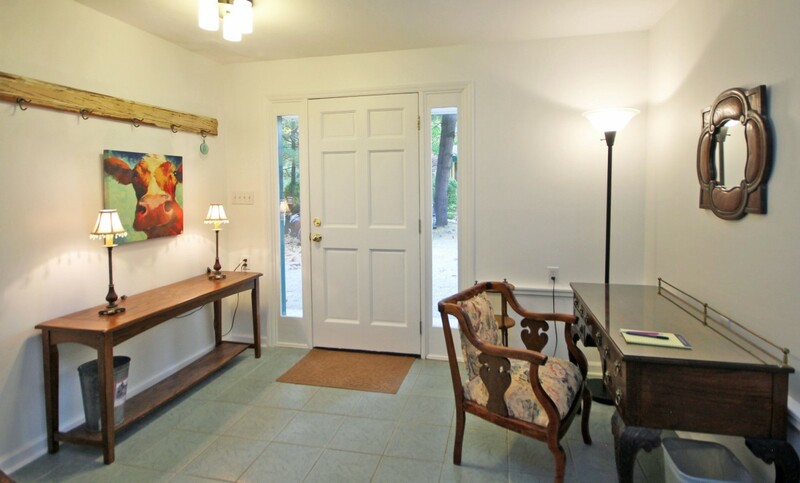 The location really is convenient to the Biltmore, downtown and all the south Asheville has to offer. 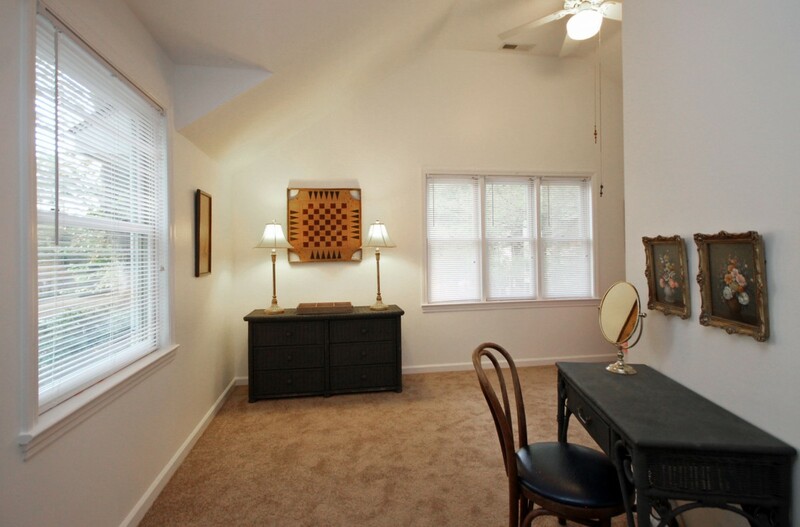 The Carriage House is a lovely two bedroom one bath unit and is listed as such. We loved our visit!! The place was lovely!! We will definitely come back!! Super cute and cozy place to spend a few nights near Asheville. You're only minutes from Sierra Nevada and about 15 minutes from downtown Asheville. Lots of amenities near by for any last minute needs (Walmart and grocery stores with a couple miles). 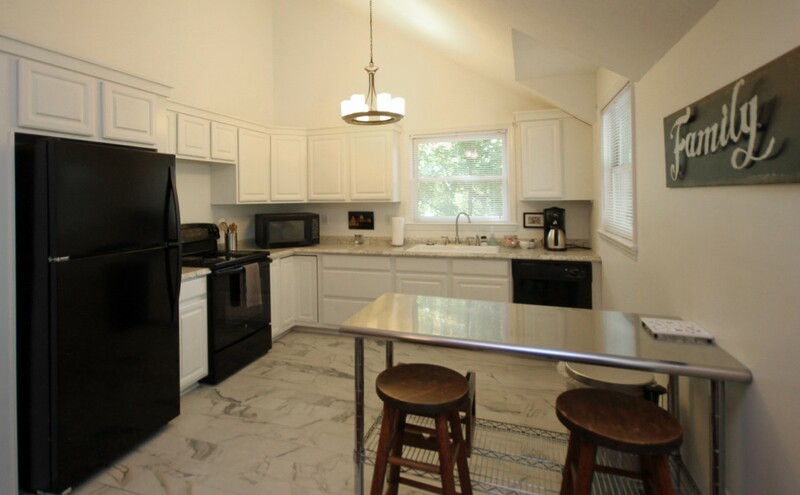 The Carriage House was very clean and had all needed kitchen equipment. Only negative: the only restroom is through the master bedroom. Was fine for our purposes, but may be awkward depending on how well you know the guests you're staying with! Would definitely stay here again! Thank you for staying. We look forward to having you stay again. Our family of three had a great time at the Carriage House. The apartment is extraordinarily clean and well-stocked. We will definitely stay here again when in Asheville. Thank you for staying! It was a pleasure to have you and we look forward to hosting you again in the future. Plenty of room for me and my family, great kitchen for preparing meals. Close to everything and right next door to probably one of the best chicken joints. The location really is ideal. Rocky's Hot Chicken Shack is great and 12 Bones is just right up the road too! We are so glad that you enjoyed your stay. The Carriage House was clean and quiet. We were pleased Arden, NC ws rally close to Asheville. An Uber ride cost us $15 for 4 people. There seemed to be stuff for cooking, although we did not cook there. 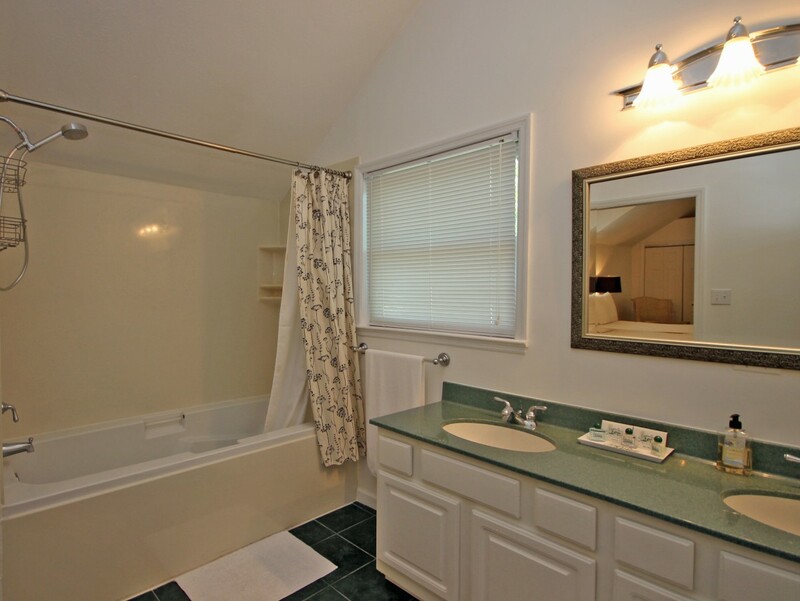 The bathroom is accessible through one of the bedrooms. We didn't know this, but since it was family renting together, it was fine. Important to know howevr. The home was immaculately clean and had all we (party of 3) needed for a long weekend visit. Loved the location - super easy drive into Asheville, but also convenient for visiting other places in the area. Would definitely return. The location is really ideal and we are glad that it worked so well for your visit. We look forward to hosting you again. My husband and I stayed here for 90 days while our home was being remodeled. The manager Elisabeth was wonderful. Always prompt and helpful. The owners are a lovely family, who were so very nice, helpful and we miss them already.The apartment was very nice and the location is great for all the Asheville and Hendersonville activities. Camille an John were the ideal guests. We truly enjoyed having them stay at the Carriage House. The house was great for us and our in laws. The beds were very comfortable and everything was so clean and neat! We were about 15' from downtown and 15' from the Biltmore estate and 15' from the outlet mall. Great location! The owners lived close by and were around and available if and when we needed anything. The only negative I can think of is that the kitchen supplies were very basic. But besides that I would definitely recommend this house!! Thank you so much for staying at the carriage house. We are so glad that the location worked so well for you during your stay. We hope that you can come again.